Need to prune tall limbs? 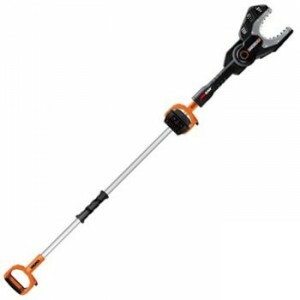 Try this WORX WG308 6-Inch 5-Amp Electric JawSaw. Equipped with extension handle, this unit is able to reach limbs up to 12 feet high. In addition to pruning and cutting hard-to-reach limbs, this JawSaw features a unique design, allowing you to make cuts directly on the ground without kickback or damaging the chain. Equipped with a set of solid steel teeth that hold the wood securely while you cut, The JawSaw offers extra stability while the chain does the work, which means you will be able to prune and chop tough branches quickly and efficiently even you are a beginner to use JawSaw. Also, there is an enclosed jaw guard around the chain to keep your digits safe during tough cuts. Powered by electricity, the JawSaw is environmentally friendly and won’t product noxious emissions. In addition, you don’t need to mix oil and gas or deal with difficult startups. Its automatic oiler constantly lubricates both the bar and chain. The JawSaw also features Auto-Tension system, an intuitive chain replacement and tensioning system.